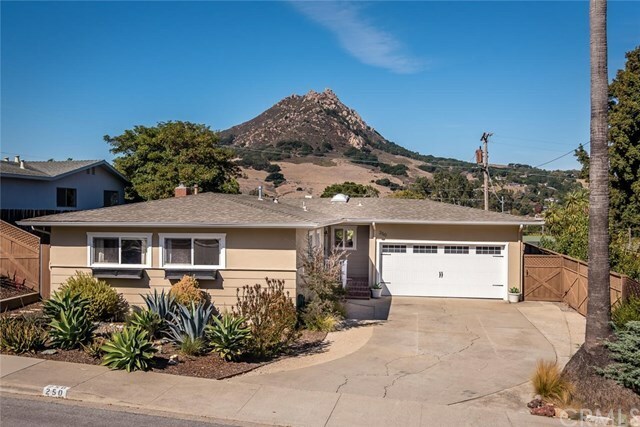 Beautifully remodeled 3 bedroom, 2 bath single level home perched against Cerro San Luis Mountain with sweeping views from Bishop Peak to Cal Poly. Great room showcases wood burning fireplace and a wall of glass, framing breathtaking views over the city. Recently remodeled kitchen with soft close custom cabinets, honed Absolute Black granite countertops, stainless steel appliances, and bar area with sink and wine fridge. Open concept floor plan, updated baths, refinished original hardwood floors, crown and baseboard moldings, custom interior doors, ceiling fans in all bedrooms and recessed lighting in living spaces. Peaceful, private fenced backyard features patio, lawn area, garden area and avocado tree. Enjoy views of Cerro San Luis and Bishop Peak mountains from relaxing spa. Additional amenities include a solar energy system, attached two car garage, professional landscaping and new exterior paint and trim. Located in desirable neighborhood in Bishopâs Peak Elementary school district near shopping, restaurants, parks, hiking and Cal Poly. A must see to truly experience this beautiful home and gem of a location! Directions: Foothill to La Entrada, take La Entrada to end, left on Hermosa.